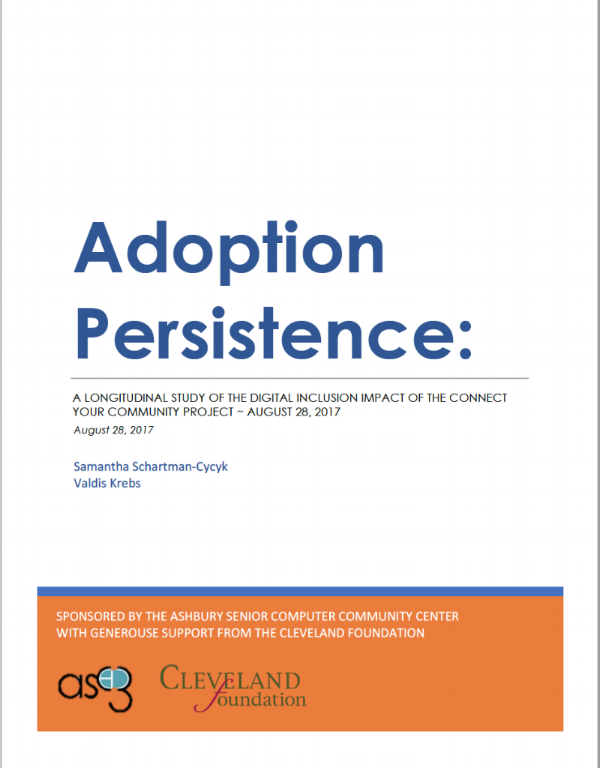 Adoption PERSISTENCE: A longitudinal study of the digital inclusion impact of the Connect Your Community Project. The Connect Your Community Project was a 19 million-dollar federal stimulus grant project funded through NTIA’s Broadband Technology Opportunities Program (BTOP) that served to train, equip and connect over 33,000 participants nationally (5,500 in the Cleveland area alone). In 2012, the project leadership team (Bill Callahan and Samantha Schartman-Cycyk) conducted a program impact study of Project Participants. This newly released report by Connected Insights describes the findings of the recent follow-up survey which recontacted 429 Cleveland-based residents/past project participants who had also responded to the 2012 survey. The findings contained in the study not only prove that high-touch community-based digital literacy programs are successful in closing the digital divide, our study shows that the impact of such projects continue even after they are over. 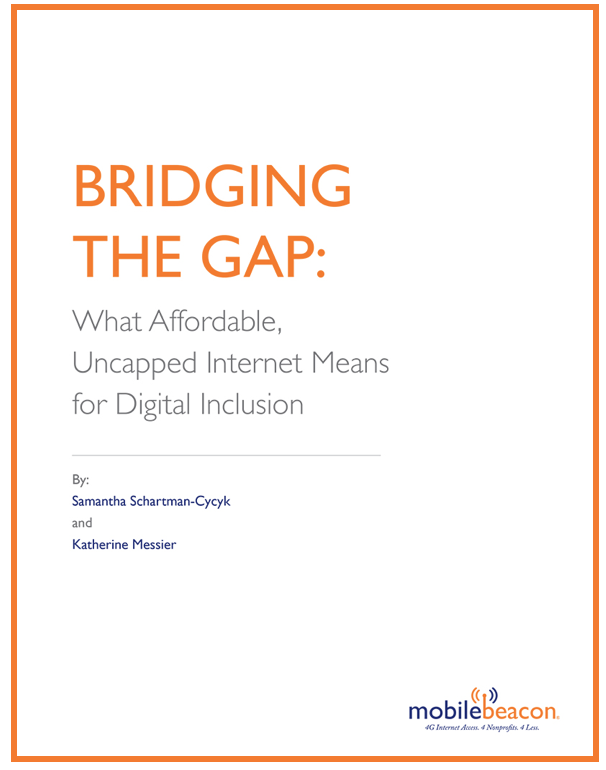 These findings will provide useful insights for any digital inclusion program manager who is interested in learning of additional ways to measure community impact, stretch resources, and grow participation and engagement. The nonprofit sector nationally supports and serves millions of people and causes that better our society, the environment, and lives of individuals and families. Community anchor institutions (CAIs), including schools, universities, libraries, museums, healthcare organizations, and other nonprofits organizations, are increasingly recognized for their role as influencers and contributors to a community’s prosperity. Providing high-capacity bandwidth to CAIs enables these organizations to become catalysts for increasing their communities’ digital literacy, broadband deployment, and adoption. Given the number of individuals a CAI impacts, one broadband connection has a social, educational, and economic multiplier effect (Internet2, 2016). While it remains a national priority to connect CAIs with wired gigabit connections, mobile broadband also plays an important role in creating connected communities. Mobile Beacon’s service is unique in that it provides $10/month, mobile, uncapped, and unthrottled service exclusively to CAIs. A ordable, anytime/anywhere connectivity gives these organizations an essential tool to ful ll their missions and maximize their philanthropic impact. Mobile Beacon’s clients are not restricted in the amount of data they can use in a given month, nor does their service slow or stop after reaching a certain data allotment. In this way, examining the online behaviors of CAIs using Mobile Beacon’s service provides rare insight into the demand for mobile broadband data since they use the data they need – not just what they can a ord. We note, however, that overall demand for mobile broadband is expected to grow by 23%, and so the documented data usage in this report should be seen as a benchmark from which these projections should be kept in mind (Cisco, 2016). People’s access to technology has become an important part of every effort to fight hunger, poverty, inequality, and countless other social causes. Thousands of community anchor institutions providing resources and services to help people become self-sufficient are finding innovative ways to help more families get online. One such nonprofit-led program is Bridging the Gap. Created by PCs for People and Mobile Beacon, this program provides refurbished computers and $10 – $13/month uncapped, unthrottled, high- speed mobile broadband service to individuals and families below the 200% poverty level. Click the above image to download the full white paper. 1. Broadly, to demonstrate the value of a simple, replicable community digital inclusion strategy (combining trusted grassroots outreach and support and hands-on basic skills training with affordable Internet options) in overcoming barriers to low income patient take-up and meaningful use of patient portals. 2. To achieve a MyChart initial adoption rate of at least 75% in an identified group of previously unconnected adult Medicaid patients, and to document a short-term incidence of subsequent “meaningful use” of MyChart by at least 50% of those patients. 3. To create, road-test and document collaborative healthcare provider/community models for a) low-income patient recruitment for digital inclusion training and support; b) effective teaching of PHR readiness skills to digitally illiterate adult learners (curriculum, objectives, assessment tools, etc. ); c) effective use of community outreach to reinforce actual PHR use by those learners subsequent to initial training. The project was overwhelmingly successful at demonstrating the value of a community digital inclusion strategy for overcoming barriers to usage of the patient portal among low income patients. A total of 895 patients met 1-on-1 with a community health worker, and about half of these had an interest in the training program. A total of 127 provided their contact information for follow-up and 32 completed training. Although enrollment was lower than anticipated, our persistence and our willingness to adapt to challenges as a multi-sector collaboration have contributed substantial knowledge. Data analysis found that the project increased MyChart usage substantially at the primary care sites in the study. In addition, our project has achieved national recognition in paving the way for collaboration between community-based training organizations and health care systems. Berg, K., Davis, W., Sheon, A., Newman, J., Daprano, J., Adebambo, I., ... & Perzynski, A. (2018). Strategies for addressing digital literacy and internet access as social determinants of health. Innovation in Aging, 2(suppl_1), 679-679. Click here to go to the full report! A mapping analysis of Federal Communications Commission broadband availability data, conducted by Connect Your Community and the National Digital Inclusion Alliance, strongly suggests that AT&T has systematically discriminated against lower-income Cleveland neighborhoods in its deployment of home Internet and video technologies over the past decade. Our analysis, based on newly released FCC Form 477 Census block data for June 2016, provides clear evidence that AT&T has withheld fiber-enhanced broadband improvements from most Cleveland neighborhoods with high poverty rates – including Hough, Glenville, Central, Fairfax, South Collinwood, St. Clair-Superior, Detroit-Shoreway, Stockyards and others. This analysis is part of a six-month effort that began when CYC and NDIA learned that residents of many Cleveland neighborhoods were being declared ineligible for AT&T’s “Access” discount rate program, solely because they couldn’t get AT&T connections at the 3 mbps download speed that was then the program’s minimum requirement. After analyzing previous FCC Form 477 data releases, along with City construction permits and other information, we’ve come to believe that the ultra-slow AT&T Internet speeds available to those Access applicants reflect a larger problem: AT&T’s failure to invest to upgrade most of its Cleveland network to the company’s mainstream technology. Specifically, AT&T has chosen not to extend its “Fiber To the Node” VDSL infrastructure – which is now the standard for most Cuyahoga County suburbs and other urban AT&T markets throughout the U.S. – to the majority of Cleveland Census blocks, including the overwhelming majority of blocks with individual poverty rates above 35%. These neighborhoods have been relegated to an older, slower transmission technology called ADSL2, resulting in significantly slower Internet access speeds than AT&T provides to middle-income city neighborhoods as well as most suburbs. no access to the competitive fiber-enabled video service that AT&T promised communities in exchange for “cable franchise reform”, i.e. the elimination of municipal cable franchising, in Ohio in 2007. Because the patterns revealed by this analysis result from a decade of deliberate infrastructure investment decisions, NDIA and CYC believe they constitute strong evidence of a policy and practice of “digital redlining” by AT&T — i.e. income-based discrimination against residents of lower-income urban neighborhoods in the types of broadband service AT&T offers, and in the company’s investment in improved service. Data from interviews with 2,300 randomly selected Connect Your Community (CYC) program participants. Topics include program satisfaction; home broadband connection status; broadband subscription choices (ISPs); employment and public service user characteristics; most frequent Internet uses; and broadband adoption outcomes for respondents as workers, parents, patients, etc. One-third of Cuyahoga County adults still do not have broadband Internet access in their homes, according to the results of an October 2012 phone survey of 1,261 county residents commissioned by the Connect Your Community Project. The survey, conducted by a team from the University of Iowa, the University of Illinois and Rutgers University, found that majorities of the county’s senior citizens, the poor, and people with “educational attainment” of high school graduation or less are among the disconnected. It also found that African-American residents are significantly less likely to have high-speed home or mobile Internet access than County residents as a whole. You can download a summary of these and other key findings here. Or, download the full survey report. In addition to Cuyahoga County residents as a whole, the survey report looks at a “subsample” of 686 respondents who live in the city of Cleveland and nine adjacent municipalities with significant levels of household poverty, indicated by Ohio Directions Card participation by 25% or more of their households. 75% of those without high school diplomas. Combined with recent U.S. Census data, the survey’s findings indicate that about 360,000 of the county’s adult residents lack home broadband connections, including 190,000 in Cleveland and the adjacent Inner Core communities. The study’s principal researchers, Dr. Caroline Tolbert of the University of Iowa and Dr. Karen Mossberger of Arizona State University, have collaborated on several important studies of the digital divide. (The most recent is Digital Cities: The Internet and the Geography of Opportunity.) CYC Assistant Project Director Samantha Schartman worked with them to design the Cuyahoga County survey, which was conducted by Rutgers’ Eagleton Institute. Read the Plain Dealer’s coverage of the CYC Cuyahoga County internet survey. 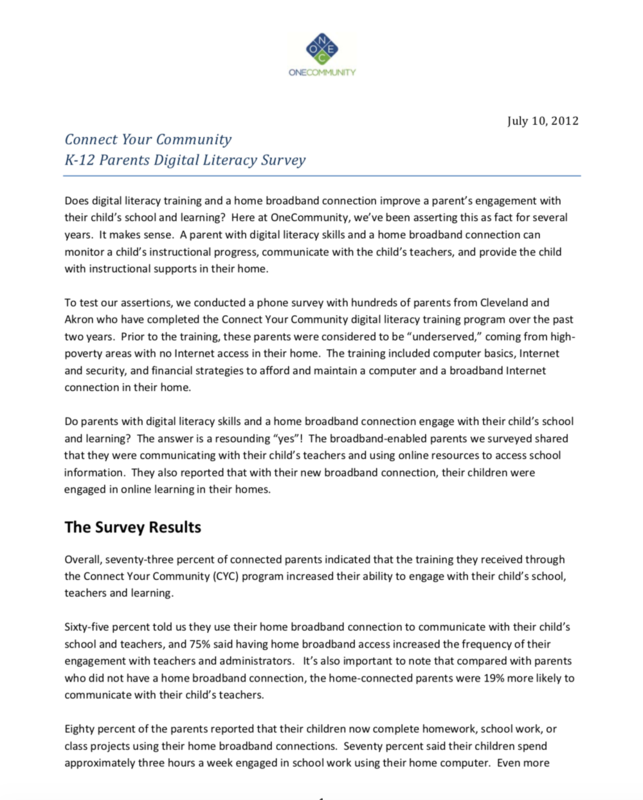 Research findings from a digital literacy program aimed at providing parents of Cleveland Municipal School District student (particularly those in grades 8-12) with free home computers and low-cost home broadband internet access in an effort to increase their awareness of school-related online resources and track its influence on college readiness.